A crisp yet lush French white blend. I am a lover of Sauvignon Blanc and enjoy tasting ones that are crisp with lemongrass undertones. I normally steer towards the New Zealand brands, but was recently surprised to find one from France with the perfect balance of tropical flavors and herbs. 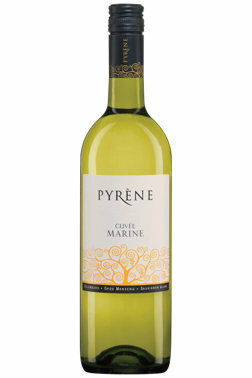 Pyrene Cuvee, the color is a medium gold, and the body is slightly fuller than the normal white wines I tend to drink. It leaves a slight linger of earthy tones on the palate while balancing well with grapefruit undertones. It is a blend of Sauvignon Blanc, Colombard, and Gros Manseng. Posted on November 10, 2014 January 9, 2015 by emilyturner23Posted in Food & DrinkTagged french wine, white wine. I also can never go wrong with a New Zealand sauvignon blanc. it is amazing how different they are from any other. I had one recently from South Africa, because the restaurant I was at did not have a New Zealand… it was so bad, and it cost me $11 a glass! thanks for the tip. I’m the same but I tried this at a restaurant and fell in love! It’s a really great blend!